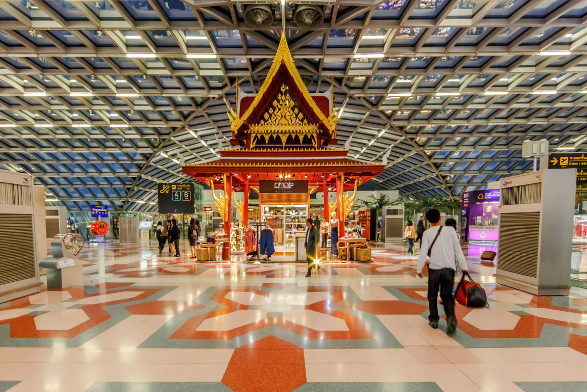 Suvarnabhumi Airport, situated in Bangkok, is one of two international airports serving the beautiful city. Suvarnabhumi Airport is home to the world’s tallest free-standing control tower. The site where Suvarnabhumi Airport is built is known as Cobra Swamp, it was drained and named Suvarnabhumi, which means “realm of gold”. Suvarnabhumi Airport (IATA code: BKK) is a regional hub for aviation in Southeast Asia and the main hub for Thai Airways International, Thai Smile Airways and Bangkok Airways. Flights to Suvarnabhumi Airport are provided by international airlines such as Qatar Airways, Emirates and Singapore Airline. BKK is a 40-minute drive from the city centre of Bangkok. Book your cheap flights to and from Suvarnabhumi Airport online! Suvarnabhumi Airport is one of the biggest international airports in Southeast Asia – covering an area of 3,240 hectares. On social networks, Suvarnabhumi Airport was the world’s most popular site for taking Instagram photos in 2012. The design of the airport allows for it to apply energy life-cycle cost savings, with an installed cooling system and effective performance materials. The airport inherited the airport code, BKK, from Don Mueang in Bangkok after the old airport ceased international commercial flights. Compare and book your cheap flights to Suvarnabhumi Airport with Thai Airways online at Travelstart! Suvarnabhumi Airport caters to a large range of food and drink options, delight in the sensational Asian cuisine. The airport has a variety of bars, restaurants, bars and bakeries available for you to enjoy. Discover a vast range of shops at Suvarnabhumi Airport, where you can explore and indulge in some retail therapy. Aside from the duty-free shopping, there are clothing, souvenirs, books, sportswear, luggage and accessories stores located throughout the various terminals. The Suvarnabhumi Airport international departures terminal has top of the line lounges for travellers on Singapore Airlines, Bangkok Airways and Thai Airways. Suvarnabhumi Airport has a wide variety of facilities, including a postal service, a medical centre, a Muslim prayer room and banking. Experience this incredible 4-star Airport hotel which is a 10-minute walk from Suvarnabhumi International Airport. Amenities include airport shuttles, restaurants and bars, free Wi-Fi, parking and a swimming pool. This convenient establishment provides a comfortable accommodation which is only a 10-minute drive from Suvarnabhumi Airport. Amenities include Thai massages, Wi-Fi, and parking. Enjoy the luxuries of this modern boutique hotel in Bangkok’s Lat Krabang area. It is a 10-minute drive from Suvarnabhumi Airport. Amenities include free Wi-Fi, a restaurant, an airport shuttle, a swimming pool and free parking. Travellers can order foreign exchange online, 60 days before departing South Africa. Siam Commercial Bank and Kasikorn Bank outlets can be found in Terminal 2, 3 and 4. Suvarnabhumi Airport has two buildings with a total of six floors as well as parking lots at the side of each car park building. The airport has a long-term parking option too. Visit Suvarnabhumi Airport’s parking web page to book a parking bay. Suvarnabhumi Airport is located 25 km east of downtown Bangkok. Metered taxis, limousines, car hire, bus terminal and airport shuttles options are available to transplant you from the airport to your destination.